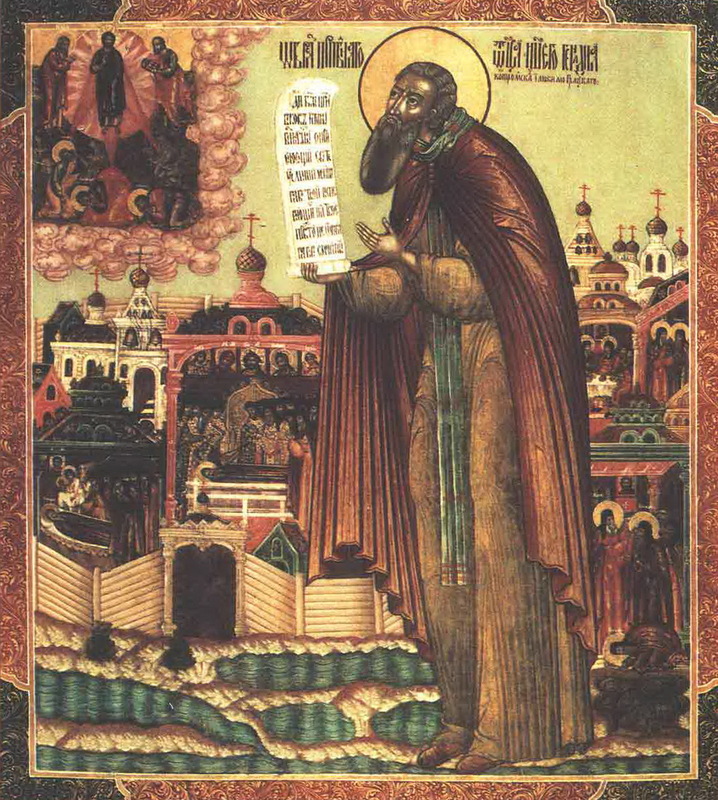 Venerable Gennadius (Gennady) of Kostroma and Liubimograd, in the world Gregory, was born in the city of Mogilev, which was then part of Lithuania, into a rich family, his parents being the boyars Ivan and Helen. He early displayed love for the church, and his frequent visits to monasteries evoked the dismay of his parents, who wanted him to spend more time with friends. Gregory, however, was firmly resolved to devote himself to God, and changing into tattered clothing, he secretly left his parental home and journeyed to Moscow, since Lithuania was primarily Catholic. He visited the holy places in Moscow, but he did not find it suitable in spirit and so set out to the Novgorod region. However he did meet his future spiritual friend named Theodore in Moscow, also striving for monastic exploits. 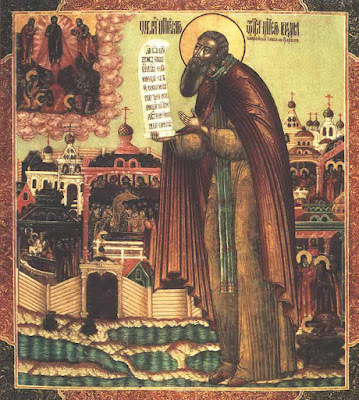 The destiny of the future ascetic was decided by an encounter with Saint Alexander of Svir (Aug. 30). 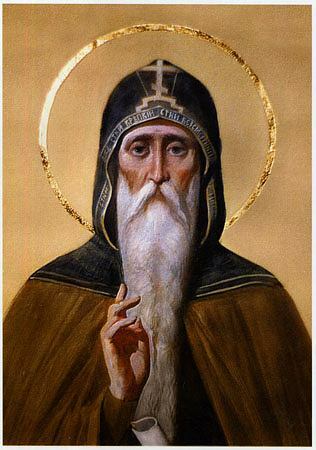 It appears that Saint Alexander did not want to have beardless youths in his monastery, so with his blessing, Gregory went to the Vologda forest to Saint Cornelius of Komel (May 19), and was tonsured by him with the name Gennadius, while Theodore was advised to return to secular life. 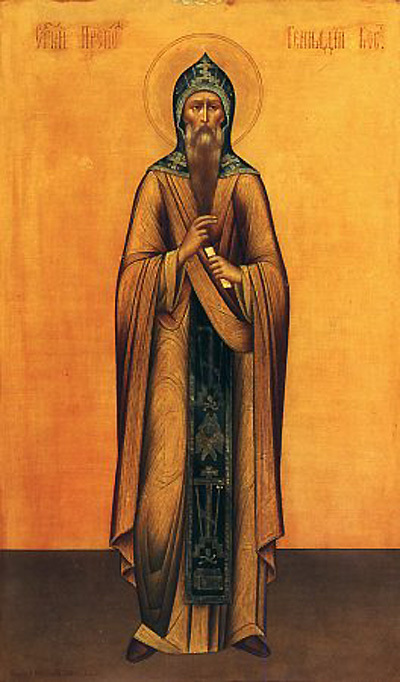 Together with Saint Cornelius, Gennadius moved on to the Kostroma forest. Here, on the shores of Lake Sura, in about the year 1529, there emerged the Monastery of the Transfiguration of the Lord, afterwards called the Gennadiev Monastery. Having become abbot, Saint Gennadius did not slacken his monastic efforts, and together with the brethren he went out to the monastery tasks: he chopped wood, carried firewood, made candles and baked prosphora. He also wore heavy chains. One of his favorite tasks was the painting of icons, with which he adorned his new monastery. For his holy life Saint Gennadius received from the Lord the gift of clairvoyance and wonderworking. Journeying to Moscow on monastic affairs, at the house of the nobleman Roman Zakharin, the Saint predicted to his daughter Anastasia that she would become Tsaritsa. Indeed, Tsar Ivan the Terrible chose her as his wife. In gratitude, Zakharin helped Gennadius to build a second church in his monastery in the name of Saint Sergius of Radonezh. Gennadius was the confessor of Ivan the Terrible and baptized his daughter Anna. He also healed the boyar Boris Paletsky from a serious illness, then he in return donated a valuable bell to the monastery. Saint Gennadius died on January 23, 1565 and was buried in the wooden Church of the Transfiguration he built. His relics were uncovered on August 19, 1644. When the coffin of Gennadius was opened, not only his body, but also his clothes turned out to be incorrupt. He was glorified by the Church on August 19, 1646. In the early 1920s, the monastery was closed, and the relics on September 28, 1920 were sacrilegiously opened and were taken to the Yaroslavl provincial museum, where they remained until the mid-1930s, unknown. Since 1995, the Savior-Gennadiev Monastery has been reborn.